Is it possible to add letters to plots to signify post-hoc (e.g., Tukey's HSD p<0.05) differences? What I normally do is use GraphBuilder to make a plot, copy it, paste it into Adobe Illustrator, and then manually add lowercase letters (a=highest, b=next highest.....f=lowest) to denote post-hoc differences (from having run the statistical model under "Fit model"). I am guessing this is the only way to go about doing this, but just thought I'd ask in the event that anyone had written a custom script that puts annotations (even just asterisks in simpler, 2-sample examples) above/adjacent to plot values. In this example, I inserted the post-hoc groups within columns. You can definitely use caption boxes. Another idea would be to drag the column with the Tukey labels down to the X-axis and nest that column in the on the other x-axis column. Here's an example of a different graph of the same data where I used the Tukey letters in the X-axis nested in the "Groups" x-axis variable. Something I neglected earlier is adding labels to individual points by selecting the rows you want labeled and going to Rows > Label/Unlabel. This should enable you to do what you want in this graph. I basically recreated your example (except without the error bars), but I had to journal the plots 1 at a time because I needed to change the labels for each panel. I'm attaching the journal file, but there's a frustrating bug where the custom line settings get messed up after saving and re-opening the journal. You'll probably notice all the lines will be dashed when you open it. I think this is possible without too much work and no scripting. The basic idea is to create a data table from your Tukey connecting letters report and join those letters to your original data matching the group name to the Levels column from the Tukey table. Then, combine the columns with the letter groups by selecting them > right-click on any of the highlighted columns > New Formula Column > Concatenate (with Space or with Comma). Next, select the resulting column and use it for labels (Cols > Label/Unlabel). 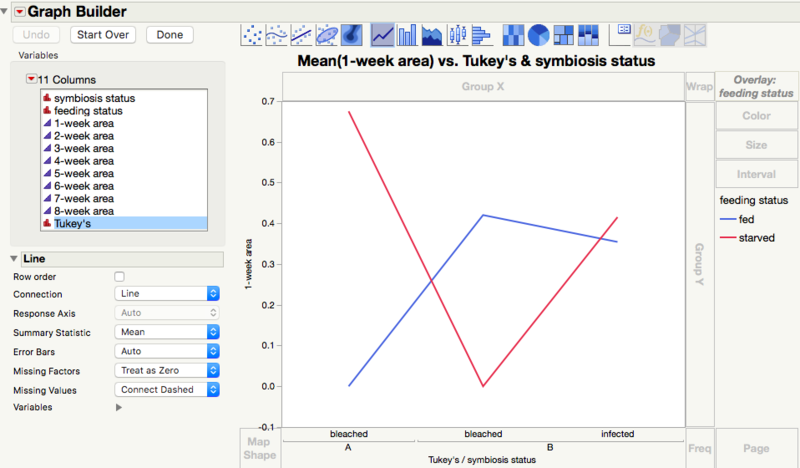 Finally, make your plot in Graph Builder. After I made a bar chart, I was able to add error bars and labels as you showed using the Control Panel controls for Bar. Awesome! It worked. I don't know why I thought it would be so difficult. It's like you said: simply copy and paste the Tukey's letter groups into their own columns, set them as column labels, and then add then to the plot that way. The only issue I see is that I can't figure out how to do it for non-bar plots, as I don't see the "label" feature for those. Any ideas? Can the caption boxes be dragged over the icons in a line plot, for instance? Thanks again for your help. Great! Brilliant idea to just have the Tukey's groups at the bottom. I'll have to think of how to go about doing this for interaction plots. As of now, I can only get it to make multiple listings of the treatment groups, one for each Tukey's group (see image.). In this example, there are two treatments, each with two groups, so there would ideally be only two groups on the x axis. Strangely, I get an error message when trying to upload the JMP table, which is why I am providing the image instead. Could you upload a picture of what the plot you're envisioning might look like? I'm sure there's some way to twist JMP's arm into making it. I want to have something like this: one treatment on the x axis (upwelling vs. non-upwelling), then the icons represent two different temperature regimes. In panel c, you can see interactions between the two predictor variables, but not in D. In panels b-d, I included letters to show post hoc differences. I wonder if I could make such a figure in JMP? Excellent! I never even thought to use the row and column labels, but it appears that they can be used with line graphs. I may best a "need" for JMP develops that is an extension of this: When you use Graph Builder, you can have it plot summary statistics, such as mean and error bars. If there was another option below error bars for post-hoc group labels that would be awesome! But then again, it's not a big deal to copy and paste the means, std. devs., and post-hoc groups into another table and then use Graph Builder to plot out the summary data (rather than the raw data). Thanks again and hope this is useful to others.